An exquisite, heart-breaking novel by an Irish discovery. Radiant with beauty, longing, and desire, and deeply touching, this literary novel, reminiscent of the works of William Trevor and Colm Tóibín, evokes the long love affair between a man and a woman, each married to another, who meet every month in a decaying hotel in Coney Island, Brooklyn. On a bitterly cold winter’s afternoon, Michael and Caitlin, two middle-aged lovers, escape their unhappy marriages to keep an illicit date. Once a month for the past quarter of a century, Coney Island has been their haven, the place in which they have abandoned themselves to their love. These beautiful, carefully-rationed days have long sustained Michael and Caitlin’s love, and have helped help them survive the tedium of their lives separate from each other. But now, amid the howling winds whipping off the Atlantic, and a snow storm blackening the horizon, this nearly abandoned resort feels like the edge of the world. On this winter day, burrowed in their private cocoon, they will discover that their lives are on the brink of change. Michael’s wife is battling cancer, and Caitlin’s husband is about to receive a major promotion, which will involve relocating to the Midwest. After half a lifetime together in their most intimate moments, certain long-denied facts must be faced, decisions made, consequences weighed and, maybe, just maybe, chances finally taken. 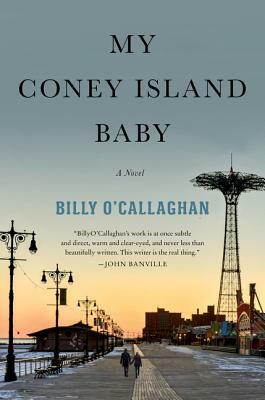 A quiet, intense depiction of love and intimacy, My Coney Island Baby reveals, within the course of a single day’s passing, the histories, landscapes, tragedies and occasional moments of wonder that constitute the lives of two people who, although living worlds apart, have been inexorably drawn together. But even in this most private of retreats, a place seemingly built for romance, the most heartbreaking of realities loom. Billy O'Callaghan was born in Cork in 1974, and is the author of three short story collections: In Exile and In Too Deep(2008 and 2009 respectively, both published by Mercier Press), and The Things We Lose, The Things We Leave Behind'(2013, published by New Island Books), which was honoured with a Bord Gais Energy Irish Book Award and which has been selected as Cork's "One City, One Book" for 2017. His first novel, really a ghost story entitled The Dead House, was published by a small Irish press (Brandon Books/O'Brien Press) in May 2017, and will be published in the U.S. by Arcade in May 2018. A recipient of the 2013 Bord Gais Energy Irish Book Award for Short Story of the Year, and a 2010 Arts Council of Ireland Bursary Award for Literature, his story, "The Boatman" was recently shortlisted for the 2016 Costa Short Story Award. He has won and been shortlisted for numerous other honours, including the George A. Birmingham Award, the Lunch Hour Stories Prize, the Molly Keane Creative Writing Award, the Sean O'Faolain Award, the RTE Radio 1 Francis MacManus Award, the Faulkner/Wisdom Award, the Glimmer Train Prize and the Writing Spirit Award. He was also short-listed four times for the RTE Radio 1 P.J. O'Connor Award for Drama. He also served as the 2016 Writer-in-Residence for the Cork County Libraries.